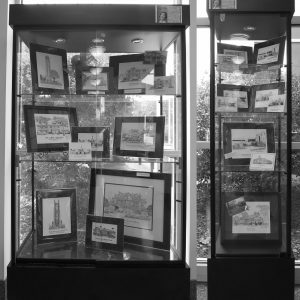 My work is in the glass display cases at the Holly Springs Cultural Center for the month of September. I am very excited and have been preparing for several weeks now. The wait list has been 18 months and long-long ago I signed up and here we are! The selection a various smattering of my range, Collegiate sketches (Duke and NC State), local landmarks, homes, schools and places of worship. As you know, once the sketch is complete, I can create note cards from the sketch. These are great for thank you notes and personal correspondence. Very, very honored for this showcase to the residents of Holly Springs!